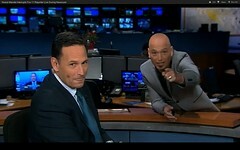 Did you see the talented comedian Howie Mandel (@HowieMandel) #videobomb Fox LA LIVE Newscast on Jan 2nd, 2013?! That was an awesome moment! And we (a few friends and I) were guilty as charged in coaxing Howie to make his impromptu LIVE TV appearance! 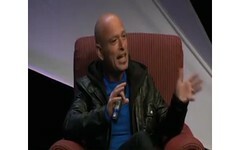 Here is the funny clip of Howie Mandel #videobomb Fox LA LIVE Newscast! So why are we guilty as charged?! What roles did we play in coaxing Howie? Well, you are in for a special treat! “Crimes/pranks” have never quite been captured like this, from the inception, to the coaxing, to the actual execution, and then the final we laughing our heads off all over a few short minutes! Have a watch of how we created this magical #videobomb moment right in our Fox LA Google+ Hangout! I just LOVE Howie in his quick witted spontaneity, you just can’t fake stuff like this. I first met and listened to Howie live when he came to the yearly Banff World Media Festival in 2011 to receive an award of distinction. “Everything I’ve ever been punished for, expelled for, hit for, is what I seem to get paid for and now I’m being distinguished for it, but the thing is the people who supported me are the people who love like, and those were few and far between, my family and my friends, but when I got into this business, what’s amazing is it’s such a group effort so any cameraman that I’ve ever worked with, any script writer that I’ve ever worked with, any producer, network executive or anything, they’ve all supported me and made this possible. I can’t speak more highly of Howie as great comedian and as a frank, blunt and honest person willing to talk about his own life challenges. And if you have time, also watch this insightful interview of Howie by Howard Stern which I watched to prepare my Google+ Hangout questions for Howie. I’m a Google+ Hangout News Consultant and I’ve been using using Google+ Hangout since the beginning in July 2011 and Google+ Hangout On Air (G+ HOA) since its launch in September 2011. To me, G+ HOA is one of the most powerful new broadcasting tools available. But like in the world of cooking, even if you have a great knife, an awesome mixer, etc you still have to have great chefs and first rate ingredients to create magic! And in our first 2013 Fox LA Google+ Hangout with Howie Mandel, that magic was created because our guest Howie rocked and we rocked! Who are we? We are our host Maria Quiban, and co-hosts Anthony Ramos, DeAno Jackson, Jimmy Louis, Kempton Lam (me), Kim Beasley, Matt Moore, Paul Roustan, Sheila B. DuBois, Stormy Henderson (screen thumbnail order from left to right). note: This article is cross-posted by me at examiner. 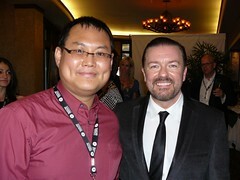 Happy 50th Birthday Ricky Gervais !!! It was my pleasure to meet and interview the world famous funny comedian Ricky Gervais and his girl friend Jane last year at Banff. Of course, to us Canadians, he is Ricky Dene Gervais! Check out my video interview and Ricky’s award acceptance speech video from 2010 Banff World TV Festival! Happy 50th Birthday Ricky !!! 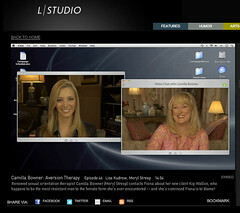 Lisa Kudrow will be at Banff World Media Festival 2011 to receive an award of excellence in digital media for Web Therapy. It is a very innovative and funny show. Have a watch of the Meryl Streep episode , Julia Louis-Dreyfus episode, and Molly Shannon episode. It will be quite fun to see Lisa and listen to her interview at Banff. Update: see a brief report of me meeting and listening to Lisa at Banff. Eugene Levy to Be Honoured at BANFF 2011! Eugene Levy is one of the most funny comedian and character actor in the world, he will be honoured with an Award of Excellence at Banff World Media Festival 2011! Eugene will also be giving a Master class which I will look forward to attend. You can register for the June 12 – 15 Banff event here. 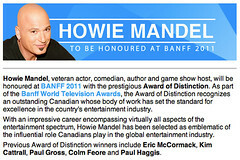 “Howie Mandel, veteran actor, comedian, author and game show host, will be honoured at BANFF 2011 with the prestigious Award of Distinction. As part of the Banff World Television Awards, the Award of Distinction recognizes an outstanding Canadian whose body of work has set the standard for excellence in the country’s entertainment industry. With an impressive career encompassing virtually all aspects of the entertainment spectrum, Howie Mandel has been selected as emblematic of the influential role Canadians play in the global entertainment industry. I’ve attended Banff World Television Festival (BWTF) for many years now and I always find lots to learn and few must attend sessions. 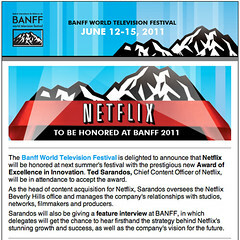 BWTVF has just announced that NETFLIX will be honored at BANFF 2011 and Ted Sarandos, Chief Content Officer of Netflix, will accept the award and give a feature interview and give people a chance to hear Netflix’s strategy and vision for the future. You can find more info on how to register for the 2011 Banff World Television Festival here. You are currently browsing the archives for the bwtvf category.